Peak Hill – no irony in that name. When early settlers came through the Parkes area they spotted a prominent hill and, in a repetitious emphasis of its splendidly convex nature, called it Peak Hill. It wasn’t long afterwards that more observant passersby spotted the glimmer of gold on Peak Hill. And it wasn’t that long after that, that Peak Hill became a bloody great hole in the ground. 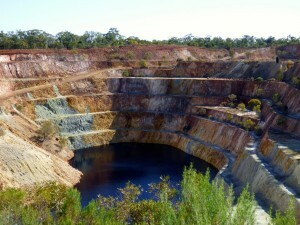 And believe me it is the sort of significant wound in the Earth that gives real meaning to the words ‘open cut’ mine. Peak Hill is by no means the largest open cut mine in our fair country, but it does distinguish itself by being readily accessible. There’s a lovely bushwalk that takes you round the main working and past the subsidiary cuts as well. The mine was worked until about 15 years ago so nature hasn’t really had time to recover, beyond a few trees managing to take hold on some of the terraces. Having marvelled over a hole in the ground, we then moved on to look at the complete opposite end of the spectrum. 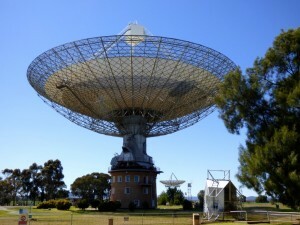 The concave wonder that is the Parkes Radio Telescope. The telescope’s enduring claim to fame was that it was the main receiving station for vision from the Moon landing – a story dramatised and immortalised in the movie The Dish. But its more enduring contribution to the World has just been as an enormous telescope peering into the further reaches of our universe. The Telescope has been upgraded many times since it was first built and is still doing science today. We hit the road again and headed back to Bathurst with a quick stop for a late lunch in Orange. Bathurst is home to the Australian Fossil and Mineral Museum, which is a small, but oh so lovely, place. The Museum houses the Somerville collection of fossils and minerals. There are only three rooms but they are packed with absolutely brilliant examples of their kind. Our visit was made even more special, though, when we bumped into one of the guides who turned out to be the mother of an old friend, and so we got a personal insight into the collection. One good thing was that the Fossil and Mineral Museum reminded us that not all digging in the ground was ugly or without purpose. But the lesson from Peak Hill and the Museum together was that there are better and worse ways of getting at all those essential minerals and metals. We did some calculations and worked out that the open wound in the ground we saw this morning had yielded an amount of gold about the size of Declan. Crinoid – out of the Matrix.